Ensuring chilled product are “within an arms reach of desire” is the mantra of a well known soft drinks brand. The supply of products that help our customers achieve their goals is Staycold’s aim and our Impulse range is the centre-piece of the branded offering. Please involve our sales team early in your plans so that we can bring forward a branded product that will meet the price point and time line that is right for your brand launch or promotional roll out. 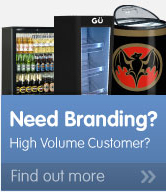 Simply tell us your brand pack size, dimensions and target market channel and we will recommend the ideal cooler to gain space for your brand in premium impulse/point of sale locations.